Borderlinx | Buy Kmart and ship worldwide with Borderlinx. Cheap rates guaranteed. Kmart USA, one of the three largest discount department stores in America, is your one-stop destination for great deals. Kmart USA sells clothing, footwear, bedding, furniture, jewelry, health & beauty products, electronics, toys, housewares, pharmacy products, and more. Since 1962, Kmart USA has gained the trust of consumers for offering great value at great deals. Now partnered with Sears, Kmart USA also offers home appliances, homeware, and furniture for great discounted prices. Kmart USA is your family's ally, with everything you need for the whole family and the home in just one place. Shop Kmart USA Gaming, Music and Movies, for your pets, for fitness apparel and sports equipment, tools, homeware and appliances. Kmart USA Cookware offers T-fal cookware sets starting under $60, or 15-piece Paula Deen set of non-stick pots and pans for around $100. Kmart USA Garden has all the tools you need as well as lawn mowers and snow removal equipment. Check out Kmart USA Electronics for high definition LED and LCD televisions, cameras and camcorders, video game consoles and more - at highly competitive prices. Thinking about a home gym? Kmart USA also carries elliptical trainers for less than $200 and treadmills starting at $300. Kmart USA is the place to shop for great value at great prices. 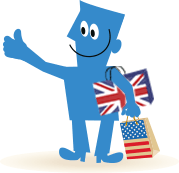 Shop Kmart in the USA and ship to your home country with Borderlinx. You pay cheap international shipping, tax & duties upfront, which you can calculate using our shipping cost calculator. A number of services are available through Borderlinx to make international ordering from Kmart USA hassle-free, including concierge, free repacking and consolidation services.